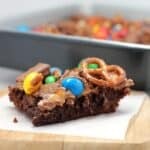 Put that Halloween bounty to better use in a fun dessert recipe, Raid-Your-Kids’ Halloween Candy Brownies. Yup. I did. Raided my kids’ candy so I could bake something new, Halloween candy Brownies. My daughter’s reaction when she gets home from school should be interesting. She loves brownies but I did use a lot of her candy, so it could go either way. I have been working on my own “Best Brownie” recipe for a long time. This is not that recipe. This one is for fun and does make a very tasty brownie. 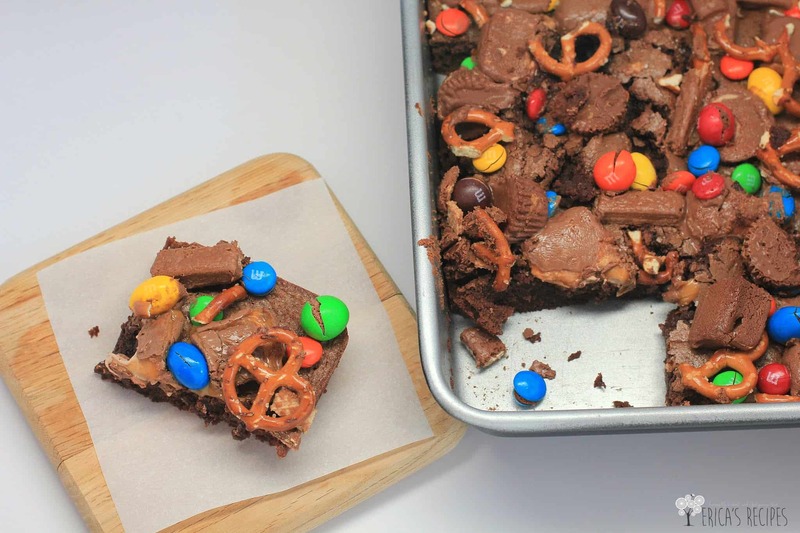 Because this brownie recipe using Halloween candy uses super sweet milk chocolate (because, Halloween candy), I cut back on the additional sugar, added espresso, and used salty pretzels to cut that sweetness a bit. And I was able to make a nice dent in the Halloween booty! 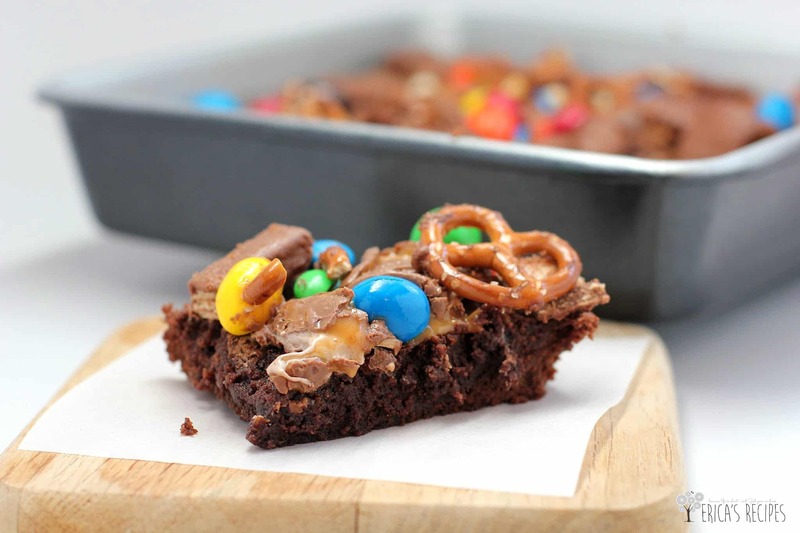 Put that Halloween bounty to better use in a fun brownie recipe. Put the butter and chocolate in a medium mixing bowl. Melt by heating in the microwave for 30 second increments and whisking after each. Add the remaining ingredients in the order given. Spread the batter in a 8x8 nonstick baking pan sprayed with cooking spray. Bake 25 minutes. Top with candy and pretzels and bake another 5 minutes so the candies get melty and brownies are cooked to desired doneness (I like them fudgy). The majority of the prep time is getting the candy wrappers off. I’m always a fan of brownies. Had them warm, with vanilla ice cream, last night. It’s not like you totally confiscated her candy, she does get it, just in a different form. Brilliant! Looks tasty. What’s next? Halloween candy ice cream? Hmmm. Awesome post! 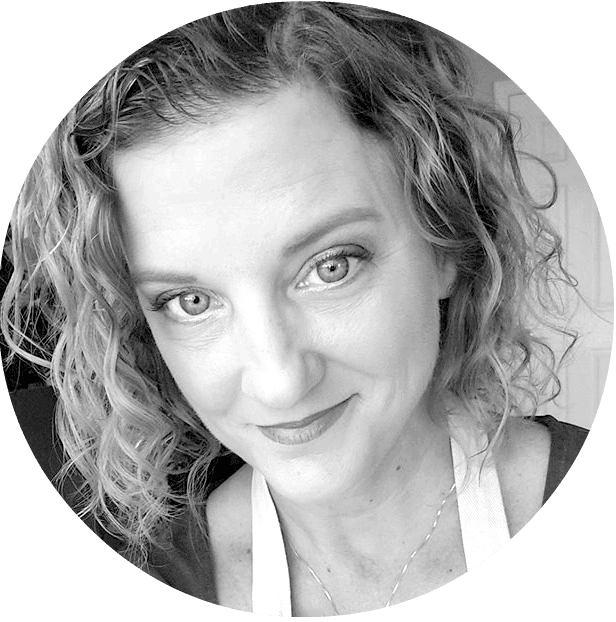 Thank you for sharing at our TGIF Link Party at A Peek Into My Paradise. Your post will be featured at the TGIF Link Party this week and was pinned to the TGIF Party Board! I can’t wait to see what you link up this week! This looks like such a delicious way to enjoy Halloween candy! Thanks for sharing! I’m afraid we will have that much candy leftover after Halloween too. My husband goes and buys more candy after I do. 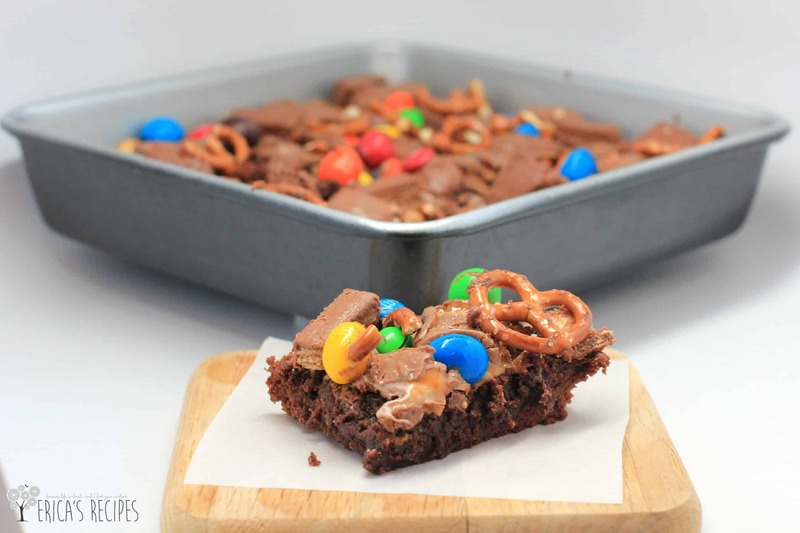 These brownies will be on my must make list after Halloween!